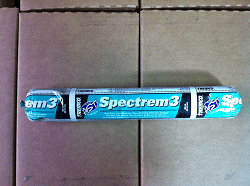 Tremco Spectrem 3 is a general-purpose, low-modulus, high performing, one-part, neutral-cure, non-staining, low dirt pickup, lower odor, construction-grade silicone sealant sausage. Tremco Spectrem 3 silicone sealant is uniquely formulated to seal porous stone, EIFS (exterior insulation and finish systems), metallic panels, masonry and pre-cast-type concrete joints. This product will not pick up contaminants, possesses low staining attributes, has a low Shore A hardness quality and applies to most construction materials without the need for priming. Tremco Spectrem 3 silicone caulk provides generous tooling time, works well even in higher temperatures and will leave a nice matte finish.